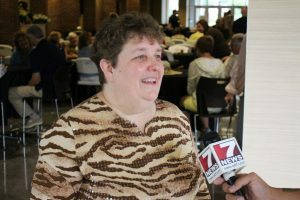 As a part of its 50th anniversary celebration, current and former John Marshall High School faculty and staff gathered at the school Saturday for a reunion. Everyone who attended the get-together enjoyed seeing the familiar faces of colleagues they worked with at John Marshall. The event included current faculty members leading tours of the school, followed by a luncheon catered by Bob’s Lunch and sponsored by Kalkreuth Roofing and Sheet Metal and the JMHS Boosters. Current JM Social Studies teacher Susan Jones organized the reunion.